Etisalat is one of the largest telecommunications companies in the world and a leading operator in the Middle East and Africa (MENA). The Company decided to expand an existing CATV headend in the U.A.E. by adding a 700-channel IPTV infrastructure. The headend system required a massive state-of-the art, satellite signal downlink system to ensure signal quality, redundancy, monitoring and control. This article unveils, via a case study of the solution integrated by prime contractor Huawei and employing an RF distribution system from DEV Systemtechnik, how such a huge system of this type can be efficiently designed to achieve lower power, rack space, and cost. Headquartered in Dubai, Etisalat is the largest carrier of international voice traffic in the Middle East and Africa and the 12th largest voice carrier in the world. It operates in 18 countries across Asia, the Middle East and Africa, serving over 100 million customers, providing mobile and fixed video, data, and TV services. The companys next-generation IPTV service has been marketed to regional consumers under the brand names e-Life and e-Vision. Etisalat has been a pioneer in the world of telecoms and entertainment, providing rich content to TV viewing customers in the UAE for over 11 years, says Matthew Willsher, chief marketing officer, Etisalat. As demand for more content and sophisticated features has grown along with viewer tastes, Etisalat has taken action to bring more channels, content and features to market. Over the years, we have keenly listened to our customers and enriched their home entertainment as per their changing lifestyles, says Willsher. In addition to local and regional Arabic channels, programming received through Etisalats head end in the U.A.E. comes from international satellite distributed networks such as BBC, Eurosport, Fox Movies, Fox Sports, Discovery Networks, National Geographic Channels, ESPN, The Filipino Channel, Arirang TV, NHK from Japan, Indian networks, Nickelodeon VH1, MTV Music, E!, and BET. As part of a major expansion with new channels and services, Etisalat decided to expand its head end to support a huge 700-channel IPTV system. It also decided to hire a system integrator to help upgrade its facilities. 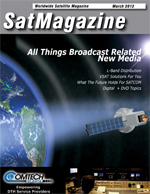 For the largest IPTV platform in the World we required a massive satellite downlink system that can pull entertainment, news, and information from more than seven hundred satellite TV channels says a Senior Manager of Etisalat. The integrator would be required to deliver a state-of-the-art system without causing any interruption or disturbance to the regular operation of the existing on-air CATV head end. The installation and all equipment had to be fully redundant with no single point of failure. Following a bidding process, Etisalat selected China-headquartered Huawei as its prime contractor for the job. With USD 28 Billion in 2010 sales, Huawei (www.huawei.com) is a leading global information and communications technology (ICT) solutions provider whose products are deployed in over 140 countries. For the satellite downlink RF distribution segment of the system, Huawei turned to the RF experts, DEV Systemtechnik (www.dev-systemtechnik.com), headquared in Friedberg, Germany. DEVs contribution to the system covers the part from the antennas to the receivers. (Top left in Figure 1). DEVs high-performance L-Band distribution system ensures superior signal quality, redundancy, signal monitoring and controllability in less rack space, using less power, and for a lower total cost of ownership, which is important to Etisalat, according to Etisalats manage involved in the project. The L-band Signal Distribution System relies on the DEV 2190, a next-generation L-band signal distribution and management appliance ideal for large satellite ground stations receiving many signals. This product (See Figure 2 Photo) accommodates up to 3 power supplies and 16 amplifiers in the front side of a 4RU chassis. The splitters and/or matrix switches are located in the back. Fixed and matrix distribution can be mixed. Each Chassis allows for 16, 32, 48 or 64 outputs (matrix switches 4:x or 8:x) and a maximum of 128 outputs for splitters (1:x), if desired with mixed configuration and impedances (50 or 75 Ohm) for inputs and outputs. Optical inputs and redundant amplifiers are available as an option. This solution delivers the highest commercially available level of RF performance in reliable, compact, space and power-conserving devices that reduce rack space cost, and power consumption, helping to minimize ongoing operational expenses for the facility. DEVs system also gives us more flexibility and control over incoming satellite RF signal routing and distribution, making it easier for us to expand in the future, says Etisalats manager involved in the project. The Signal Distribution System is controlled and monitored via web interface or SNMP and enables the adjustment of gain and RF sensing thresholds as well as LNB bias current. The variable tilt functionality for extended L-band ensures a constant signal level over the entire frequency range, an essential feature for high-availability applications. Signal LEDs in the front panel show key operational parameters at a glance, for example, that the unit is properly functioning locally or remotely, that the power supplies are doing fine, the temperature of the distribution amplifier modules is within limits, and that the CPU is communicating properly with the system. It also indicates if there are alarms or error messages requiring operator attention. These features give Etisalat flexibility, and control in a cost-effective package. The solution that was implemented represents the latest in RF distribution technology of this type. Component redundancy, device level redundancy, and system design redundancy with extensive monitor and control features ensure continuous on-air operations. Signal Recording captures signal properties in the input path of the system and records them in user-defined time intervalsso system administrators get topical feedback on signal changes over time and see the dependence of signal properties on environmental influences such as interference, precipitation, and temperature. DEVs L-band Signal Distribution System now comes with a Signal Recording function as a standard feature that gives ground station operators easy and affordable access to recorded RF signal parameters over time, which can help in efforts to identify and mitigate interference at head ends. Signal Recording allows a user to access the RF signal level of any L-Band signal and/or LNB feeder current directly via the web interface of the DEV 2190. Recorded data are displayed in a user-friendly graphical user interface, and can be exported. Systems already in the field can add Signal Recording by purchasing a software upgrade. The Etisalat super head end case is an excellent example of the kind of L-band distribution solution that makes sense to deploy today in CATV and IPTV head ends. Other suitable applications include DTH broadcast centers, government satellite monitoring facilities, and teleports and even satellite TT&C (tracking, telemetry, and control) facilities that need to route and distribute large numbers of L-band signals. Extensive built-in monitor and control features, switching, and redundancy optionsall without the added costs of an external M&C system required for some older generation solutionsmake the new generation of L-Band signal management solutions easier than ever for operators. Given the many other challenges that satellite ground facilities face today, this should be welcome news to earth station designers and operators. Daniel Freyer is Founder of AdWavez Marketing (http://www.adwavez.com), a marketing agency serving clients in the satellite and technology industries. He has over 20 years of global industry experience helping spacecraft manufacturers, satellite operators, service providers, broadcast and telecoms end-users, equipment manufacturers and system integrators grow their businesses. DEV Systemtechnik develops and produces a complete range of leading-edge, high-performance products and systems for the optical and electrical transmission of Radio Frequency (RF) signals via coaxial cable or fiber for satellite, cable, and broadcast television head ends. DEV products include distribution amplifiers, splitters and combiners, switching systems, distributing matrices, routing products, multiplexers, and fiber-optic RF signal transmission systems  all built to meet the highest standards of system availability, reliability and controllability. Named several times to the Deloitte Fast 50 list, DEV has achieved a compound growth rate of 462 percent over five years. Known for its high-end products and RF signal transmission quality, DEV also recently started shipping the first models in its new CFP (Core Function Products) series of RF Switches, Combiners and Splitters, which are used to route and distribute RF signals within earth stations and head ends. DEVs new CFP series offers up to 70 percent cost savings for cable and satellite head ends by streamlining devices down to their core features, according to the company. DEV America LP, the companys U.S.-based subsidiary is exhibiting at Satellite 2012 in Washington, DC., Booth: 1630.